Other events at this location. Send an email to ride leader/event organiser: Mike Ashton. 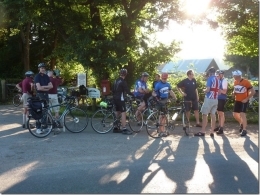 We have established a Community Cycling club for Waterlooville - a series of cycle rides in the Waterlooville area for people who are new to group riding or who haven't cycled for a while. All are circular routes in moderate terrain that avoid steep inclines but may include a steeper descent. As far as possible we will avoid busy roads. Routes are all less than 30km long (most substantially less). Our aim is to make cycling enjoyable, safe and welcoming for all. You can find out more and register interest in WCCC rides here. Replies you enter here get sent to every member that has registered an interest in this type of ride/event. If you want to ask the event organiser a question that is not of general interest, please use the 'Contact us about this event' link towards the top of this page to avoid creating unnecessary emails. Thanks. We have had a lot of spam comments, so each comment now has to be moderated before it can be shown. It can therefore take some time before your comment appears. There is no delay, however, if you use the 'Contact us about this event' link. You may use these HTML tags and attributes: <a href="" title=""> <abbr title=""> <acronym title=""> <b> <blockquote cite=""> <cite> <code> <del datetime=""> <em> <i> <q cite=""> <s> <strike> <strong> . Alternatively, if you have an id for the site, log in to remove restrictions on HTML. 27 Apr: Trotton & East Meon? Havant’s new Cycling and Walking Plan!